Whether it’s used while you upgrade and remodel, to accommodate increased volume, or for disaster recovery, a mobile CT or PET/CT unit might be the ideal solution either on a short-term or long-term basis. Independent of the mobile imaging provider you choose, there is some lead-time needed to prepare your facility for the service from a regulatory standpoint as well as from a site planning position. 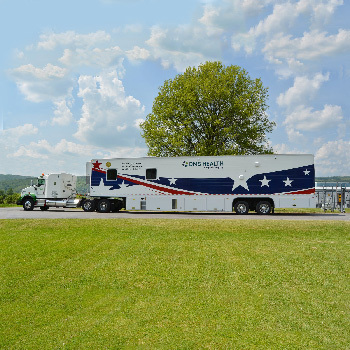 Adding a mobile CT unit to your facility requires the x-ray tube to be registered with the state and an annual evaluation performed by a licensed physicist. Some states also require initial acceptance testing be performed by a licensed in-state physicist. Ideally, the mobile provider’s Radiation Safety Officer will coordinate this service. The process could take anywhere from 2 weeks to 3 months, depending upon the state. In the case of a PET/CT unit, if the mobile company does not currently hold a radioactive materials license in a particular state, a new application must be submitted. While the approval process can take between three and six months, in many states, the company also has the ability to work under reciprocity for a temporary time period until the new application is approved. When a current radioactive materials license is already in place, only an amendment to include the additional location address and authorized user is needed. An amendment can take one to three months, depending upon the state. As with a dedicated CT unit, the PET/CT x-ray tube must be registered with the state, and an annual physicist evaluation will be performed on both the CT and the PET portion of the scanner. A memorandum of understanding must also be signed by both the facility and the PET/CT provider. This document outlines the responsibilities of each party and as evidenced by their signatures, their agreement to the assignments. It is required in all states. Choosing a physical site for the mobile unit is an important decision. Space, shielding design, proximity to your building, and occupancy of the surrounding areas are important factors to consider. The recommended support pad for the mobile unit is concrete and is 10’11” x 40’8”; the measurements for the recommended service pad are 21’ x 58’, which will allow full-service access to the unit. You’ll also need to consider the size and weight of the trailer when deciding on an area. Its overall weight is 57,000+ pounds, and it is 53’ long. The designated area should provide ample space and be able to adequately support the trailer’s weight without concern of shifting or sinking. Asphalt is ideal because it allows for a firm, level surface, but tightly packed gravel is an option, as is grass in some situations. Another consideration is power to the mobile unit. A single electrical power source, 3/N/PE AC 480V service fused at 150 amperes, is required for operation of a PET/CT system. It should be located within 300 feet of the main power source. A Lockout/Tagout provision in accordance with OSHA Standard 1910.147 is also required. The mobile unit will have three telephone connections. For use at the site, you’ll need to purchase and install one Hubbell all-weather telephone connection. 50’ phone cords are included with the mobile unit, and the unit is also supplied with 2 CAT5 data line connections, along with the required 50’ data connection cables. These are the major highlights of the planning phase that you’ll need to consider. Once you decide to move forward, many companies will offer a site-planning guide that delivers more detail, including model numbers and requirements specific to their service to ensure smooth delivery, set up, and proper functionality.